The Palace of the Lost City is an extraordinary and unique world-class hotel set in a 25 hectare lush botanical garden and surrounding golf courses. 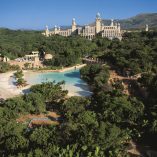 The Palace of the Lost City forms an integral part of the fantasy world of pleasure and luxury that has been created at the famous Sun City Resort. The Palace of The Lost City is widely regarded as South Africa’s premier hotel and one of the most extraordinary hotels in the world. 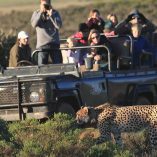 The Palace is set in the North West Province, 166 km north west of Johannesburg, and adjacent to South Africa’s 3rd largest game park – The Pilanesberg. The Palace has 338 luxurious rooms and suites that offer royal hospitality with wonderful views over water or jungle for guests to choose from. The furnishings are intricately hand-carved and reflect the flora and fauna of South Africa and attention to detail that emphasizes the personal touch. The epitome of regal luxury is the King Suite (one of the four big individually named suites available on request) with hand-carved walls, frescoed ceilings and hundreds of custom designed items adorning two bedrooms, lounge, two en-suite bathrooms, guest powder room, library, butlers pantry and balcony. All luxury suites also feature a sauna and jacuzzi bath. All standard rooms have entrance foyers, en-suite bathrooms, lounge and seating areas. Standard amenities include a carved armoire which contains the colour television, safe, refrigerator and butler stations; a direct-dial telephone; radio; hairdryer; electric razor plug (110/220v); air-conditioning; ceiling fan; 24 hour room service and message service. The Palace has an award winning spa offering a comprehensive range of treatments and programmes competing with the best spas in the world. Luxury meets with world-class treatments, equipment and professionalism.Palace of the Lost City has a health spa on location at the hotel. Spoil yourself, with a treatment at Palace of the Lost City’s Spa, situated in Sun City, Sun City & Pilanesberg. The Palace of the Lost City has several outstanding restaurants to choose from. The Villa del Palazzo Restaurant overlooking the swimming pool at The Palace specialises in northern Italian Cuisine. Breakfast, lunch and dinner are served in the Crystal Court of the Palace Hotel. The poolside braai buffet and snack bar provides light lunches, buffets and snacks in a relaxed atmosphere. A hot buffet breakfast is icluded in the room rate. The Palace has two stylish bars, ideal for specialist sun city cocktails, pre-dinner and after dinner drinks and socializing. Mini-bar facilities in suites. 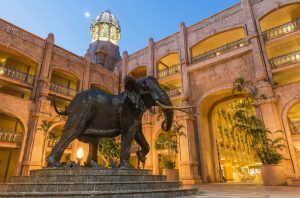 Within The Palace are three meeting rooms opening onto the Elephant Atrium dominated by the life-size bronze sculpture of Africa’s famous elephant, Shawu. State-of-the-art equipment is available and 24 hour professional assistance is on hand. Banquets at The Palace are also a memorable experience due to the fine dining banquets and breathtaking scenery. All of the conference facilities at The Palace are superbly elegant and reflect the prevalent African theme. Each room is 7m by 6,5m, and in total can accommodate 80 people in theatre style seating. The decor carries an element of the rich, verdant foliage of the gardens and dramatic carved-stone design features. Another luxurious room with doors set beneath arches of windows which overlook gardens. This double volume area can accommodate 90 for a banquet and 180 in theatre style seating. Within the Royal Chamber; mahogany paneling reaches up to the hand-carved ceiling with elephant heads serving as corbels. From the coffered ceiling hang four three-tier chandeliers in bronze and faux horns. At the far end of the room is a console table resting on carved elephant legs. This boardroom can accommodate 14 people and opens onto a terrace. The superbly hand-carved chairs surround an oval table inlaid with six different types of wood. Carved wood paneling decorates the walls with French windows on the eastern side opening out onto a spectacular view of the resort. The Hall of Treasures in the Entertainment Centre has two areas separated by three shallow steps and Magical Rock Garden. It can accommodate a cocktail function of up to 700. The Pilanesberg Room in the Entertainment Centre can accommodate up to 800 for cocktails or 600 for a banquet at round tables. The room may also be sub-divided in two. On the promenade level of the Entertainment Centre is the Royal Ballroom, which can accommodate up to 1,200 in conference style seating, or 800 for a banquet at round tables. There is a number of breakaway rooms at the Entertainment Centre, which can accommodate from 10 to 90 people. The Sun City Entertainment Centre is also home to the Superbowl, one of Southern Africa’s finest venues for sports, entertainment and product launches. This indoor venue, which can seat 6 855 people for a show or handle up to 10 500 with a standing configuration downstairs, it boasts some of the most modern lighting and sound facilities in Africa. Botsalanong Boma and Letsatsing Boma are two unique open-air African banqueting venues, which with a huge bonfire and African dancers make it an unforgettable experience under the stars for all! The Letsatsing Boma now offers a unique dining experience… The African Way! This includes welcome drinks, a scrumptious African barbecue, full cash bar, marshmallow toasting and cultural dancers to entertain. The Elephant Wallow is situated at the Letsatsing Game Park, a large thatched venue overlooking a magnificent waterhole catering for up to 65 guests under thatch. Bush dinners and lunch barbeques can be taken with the Elephants themselves providing the main attraction. The Cultural Village is situated near the entrance to Sun City Resort, and caters for groups up to 80 people sitting. It is a village-style boma ideal for cultural themed evenings. 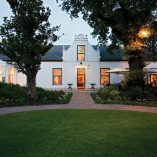 Try our traditional township restaurant and bar which is open daily until late. The Shebeen can be privatised for any of group bookings. Sun City is home to one of the largest casinos in the southern hemisphere, offering American Roulette, Blackjack, Punto Bunco and a variety of slot machine games. 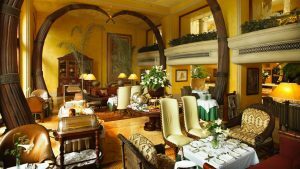 The Palace of The Lost City is widely regarded as South Africa’s premier hotel and one of the most extraordinary hotels in the world. 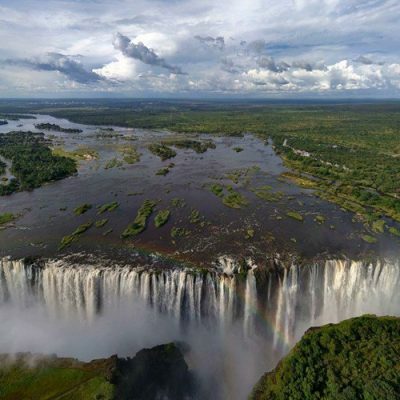 The Palace is set in the North West Province, 166km north west of Johannesburg, and adjacent to South Africa’s 3rd largest game park – The Pilanesberg. 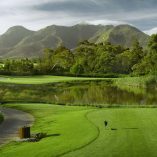 A variety of sports activities may be enjoyed at Sun City. 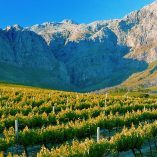 Year round good weather in this part of South Africa, ensures that Tennis, squash, swimming, golf, mountain biking, horse riding, and parasailing are all on offer throughout the year. Sun City has laid out spectacular jogging trails. Sun City’s Gym and Health spa keep you perfectly toned, and a beauty treatment is the perfect way to wind down after a workout. A wide range of water sports including Water-skiing, Parasailing and Sunset Cruises can be enjoyed at the Resort’s Waterworld. The Super Bowl is Africa ‘s finest venue for concerts. Stars such as Queen, Bryan Adams, Frank Sinatra and Rod Stewart have performed at this 6,000 seat arena. This arena is also one of South Africa ‘s favourite venues for beauty pageants and sporting The Sun City Resort spectacular is famed throughout South Africa as a glamorous & sophisticated theatre production. This stage revue pulsates with energy and is well known for spectacular sets, trapeze acts and glorious costumes.